The blessings in my life include the times that our whole family—give or take a few—comes together to celebrate. 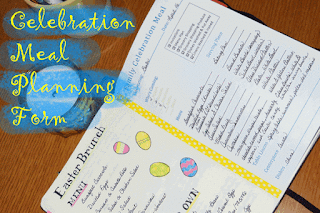 Whether it's to celebrate a holiday, like Easter, or a life event, like a birthday, baby blessing, or graduation, nothing beats gathering for a meal. Sometimes there are gifts, games, or backyard playtime. Often there are multiple conversations going on at the same time. Laughter is always included. The meal is the foundation of whatever else goes on, it seems. This Easter, I thought it would make both planning and recording easier if I had some sort of form to work with. You can see in the photo that I started with a hand-written menu in my bullet journal, but I soon saw the need for a higher level of organization. My form has a place to fill in the event and the date. I listed the family households with space to write how many were coming from each family. 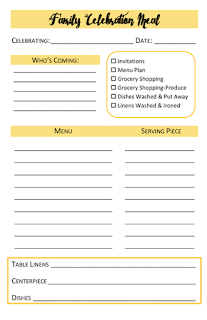 There is a checklist for auxiliary tasks, like invitations, grocery shopping, and dishes and laundry. Then I have a place to list the menu items and which serving dish I will use. (I always wait too long to figure that out, leading to a last-minute scramble for platters and bowls.) Finally, there are spaces to record what table linens and dishes I will use and what will make up the centerpiece. (For the record, no one is surprised when the centerpiece is the bread basket.) These, too, are on the form to encourage a timely decision, as well as for record keeping purposes. I thought that you might like to use a helper like this, too. I also thought that you don't need my children's names on your form, so I redesigned it to make it a little more useful for you. Just click the appropriate image below to download the form in the size you will find most useful. 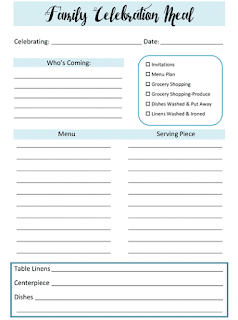 Let me know if you use this form for your own family celebration, and I'd love to see ideas for changes and improvements!